Our reason for posting Juan Pablo’s journey has been to allow friends and family to remain updated with his progress and to share specific prayer needs. Emily and I desire to be as transparent as possible while allowing the story of God’s love in his life to be told understanding that his consent has been given for the content shared herein. 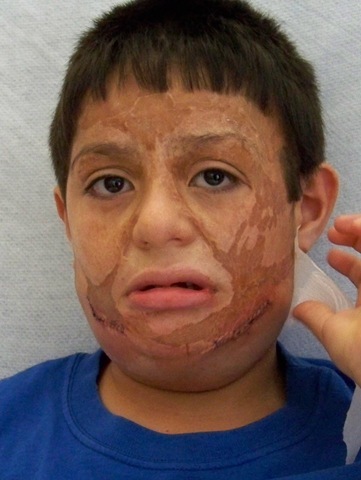 Just 3 months ago, Juan Pablo underwent surgery to insert skin expanders below his jaw line on each side of his face. We remember how brave and confident he was just before anesthesia. We, of course, were a little scared, but trusted God would deliver him through the surgery. The time between the updates received from the OR nurse as to the progress of the surgery is still fresh in our minds. The Lord, who was near to JP at his infant accident in Guatemala, had also been faithful to inspire this procedure and deliver him through it. After being in the recovery room for a couple of hours, he was transferred to a private room in the burn unit. While there, he met a couple other children who had been burned and saw the equipment used to treat patients with burns. 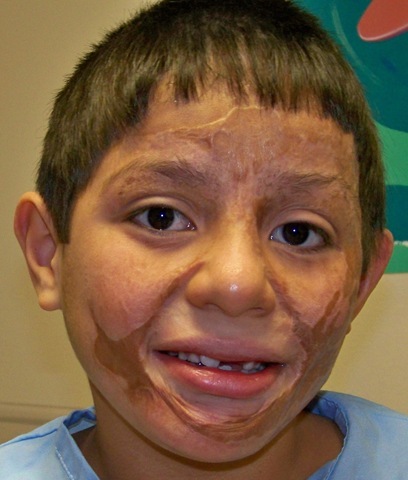 I believe he connected the devices and mechanisms to the need of severely burned skin just like his. God had connected us to Riley Children’s Hospital to learn of this new procedure and surround us with experienced and friendly medical staff. JP was comforted alongside by his Mama and Papa, grandparents, and of course brother Sam, who is seen below about to bite into his brother’s IV tube. 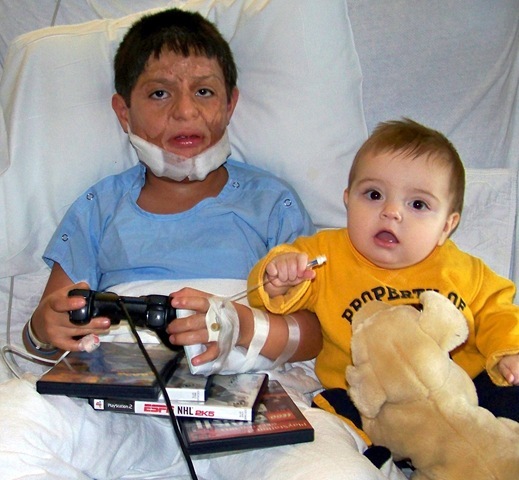 We knew Juan Pablo was progressing along when he was able to keep down food and prop up his hands to play video games provided by the burn unit. Just like being at home! Before being discharged, he wanted to take a picture of himself without the bandages to see his stitches..
Due to the delicacy of the expanders, Juan Pablo has been restricted to only light activity. 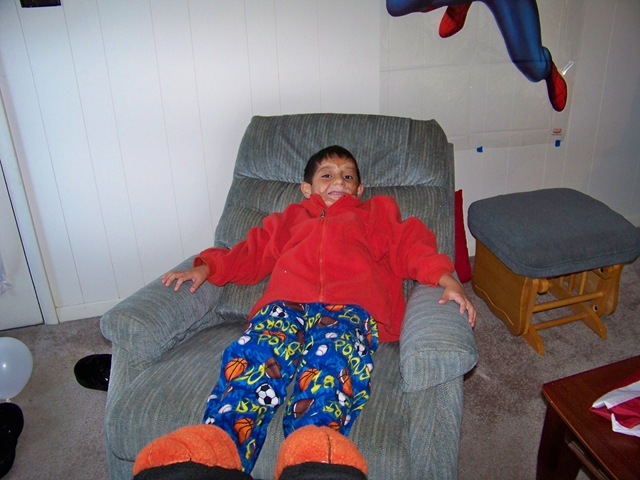 We agreed that it would be difficult to harness his 8 year old energy level, but thought that having the surgery during the winter season would be the safest. Each week, a visit with the plastic surgeon would be necessary to fill the expanders. Since the initial surgery, we’ve gone to Riley about 12 times to have JP’s expanders filled a little each time. He has done so well during each of the appointments, which consist of medical staff evaluating the expanders, then inserting a small needle through an internal port of each expander. A syringe of saline is given in various amounts up to the point that Juan Pablo is in pain. A helpful tool that has been used during the expansion visits is an iPad loaded with tons of games. As JP receives the injections, a Child Life Specialist sits with him and the tablet to shift the focus of the pain through the distraction of a game. Everyone was surprised how quickly he was cruising up the levels of the games he played. No shocker to us, but I have a feeling he’ll be asking for one of those for his next birthday. We’ve had a couple scary moments just weeks after the initial surgery. Juan Pablo’s neck began to swell. 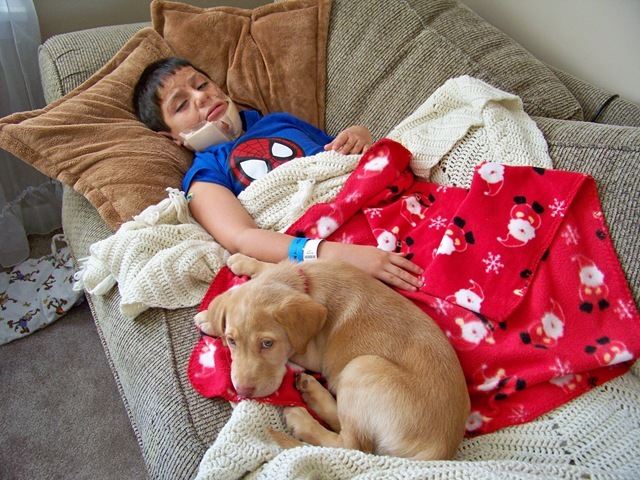 The first time this happened, we took him to Riley’s ER when an on call surgeon drained the excess fluid from his neck and tested it to find that it was not infected, but only that his body was probably just responding to the new foreign objects present. Outside of this, JP hasn’t had any trouble except for some pain after receiving the injections. We’ve trusted the Lord’s presence with our boy through one of the biggest moments of his life. Our prayer has been consistent in that God’s best for JP would be done, he would continue to have a compassionate heart, and the testimony of what Jesus Christ has done in his life would speak of His goodness and love more than ever before. So, now we are ready for surgery, which is scheduled for Tuesday, March 22nd at 11:30 AM. 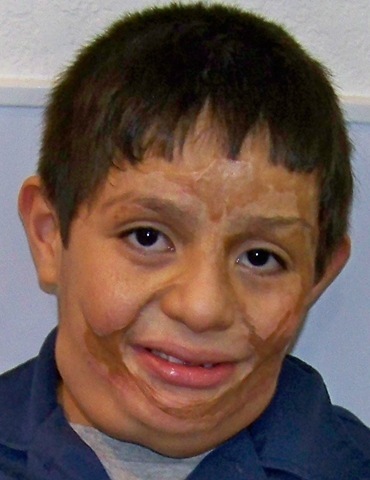 During this surgery, the new skin that has been expanded over the past several months will be stretched up and set in place of the scarred skin located just below his eye line, around his face, and down to the chin. We are all excited about this change for Juan Pablo. 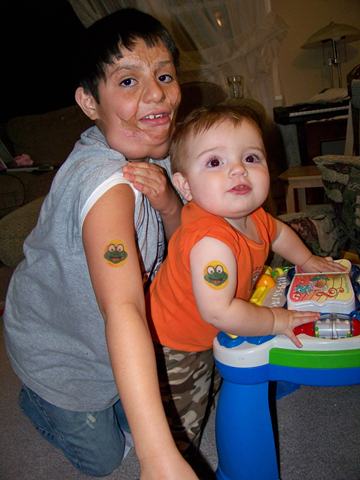 He is especially ready to get the expanders out and comments often that he is excited for his new skin. God led us to JP because of his burns and we will miss that about him. Our response has always been that we love him and see beauty just as Jesus sees him. Though the outward appearance will change, his heart and identify as a special child of God will remain. Wisdom and guidance for the surgeons, nurses, and other medical staff involved in the surgery. Comfort from the Holy Spirit in Juan Pablo’s heart before and after the procedure. The healing process would be quick and effective. 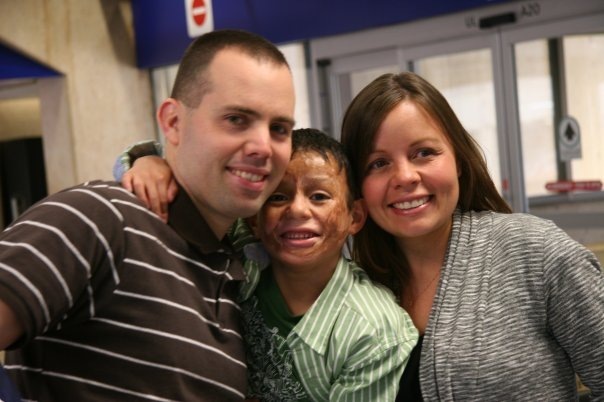 It’s hard to believe that five years ago, we first set eyes on our future son at an orphanage in Guatemala. 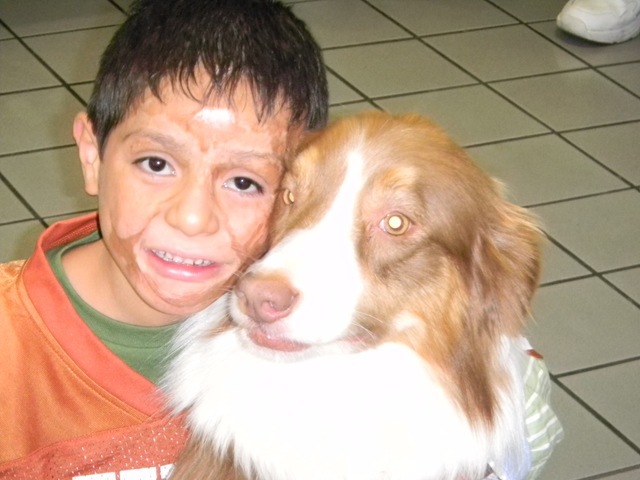 It was the scars on his face that God used to move our hearts toward adoption. When Jesus asked, ‘who would I choose’ for your family, we unanimously agreed that it was Juan Pablo. Not only did we pursue him for the calling, but fell in love with JP’s kind, compassionate, and playful heart. We knew that the road ahead wouldn’t be easy to care for a child with this special need, but would trust the Lord to be faithful to provide wisdom and direction for his future needs. 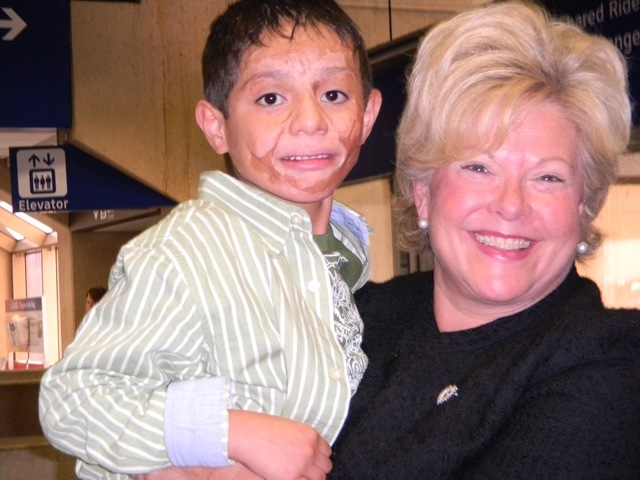 When JP was a baby, he suffered burns of up to 80% of his body from an accidental explosion about which we know very little. We believe and share with our son that Jesus was with him during and after the accident and it was a miracle to live through this in a 3rd world country. 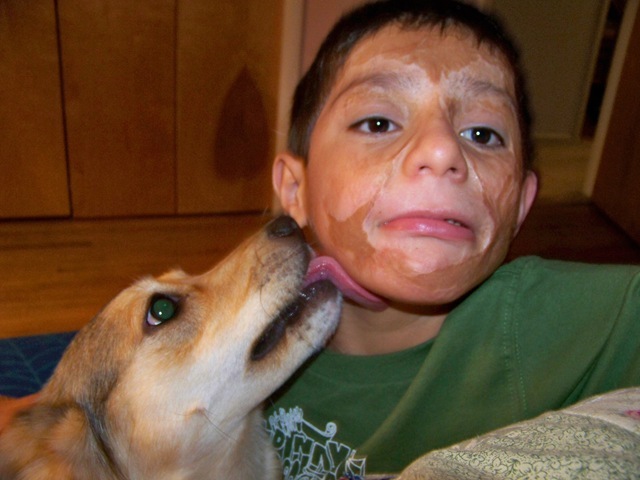 Early treatment consisted of skin grafts to daily application of ointments on his face. 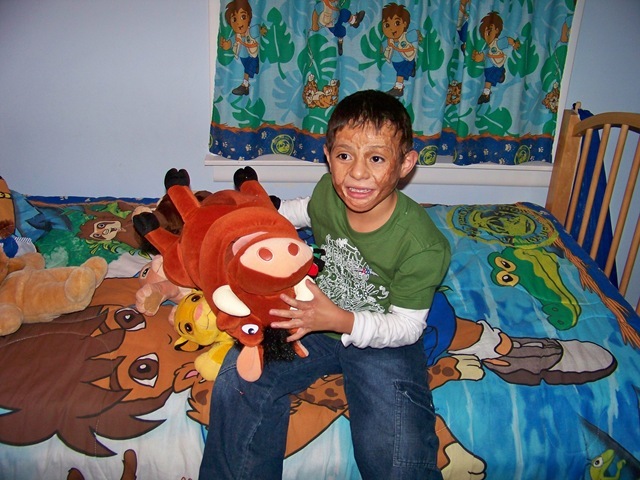 We knew that by choosing to follow God’s plan to adopt Juan Pablo, there would be decisions to make in regard to treatment of his burns. 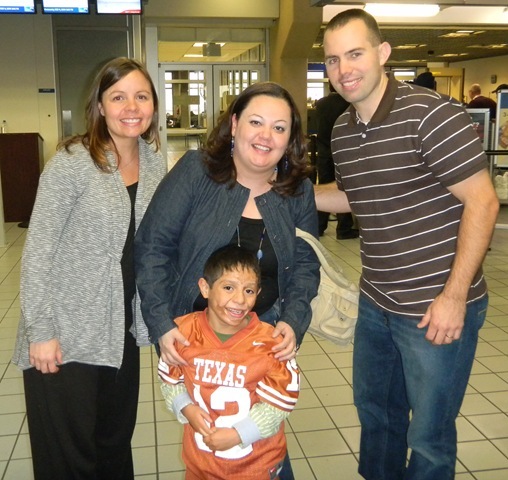 Upon arriving to the United States, we arranged for a visit with the International Adoption Clinic at Riley Hospital in Indianapolis to assess JP’s overall health. Our consulting physician referred us to a plastic surgeon who specializes in burns. From that meeting, we learned that as Juan Pablo ages, his jaw will have difficulty growing and the skin on his face will not stretch with his growth. We have noticed this already in his difficulty opening his mouth and his smile pulling down skin beneath his eye. The surgeon informed us that we would have to do something for Juan Pablo in the next couple of years. We were pleased to hear that there were other options that were less invasive and would look better rather than taking additional skin grafts. After absorbing the information, we prayed for months asking for wisdom to make the best decision possible for our son and the timing of it. The procedure we have chosen consists of expanding skin by inserting a balloon like object in the neck, which will remain there for up to 3 months. The reason for the neck as the location is because it most closely matches the good skin on his face. Each week, we will drive to Indy for the surgeon to evaluate the skin expansion process and fill the balloon as needed. 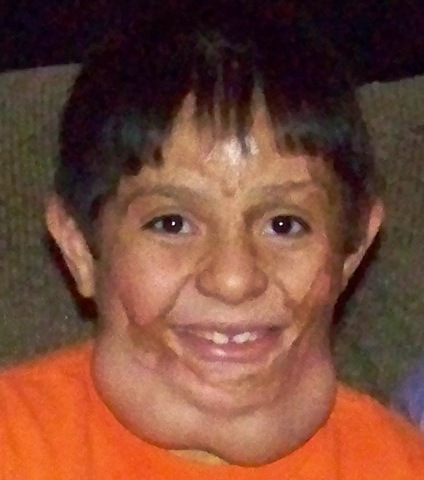 At 3 months, the expanded skin in his neck will be pulled up to his cheeks and chin while the scarred skin is removed. The first part of the procedure to insert the skin expander(s) will take place on Tuesday, December 14th, 2010. We felt that winter would be the best time to begin this process since JP can’t be as active usual. The more invasive surgery will take place in March and he will probably need a couple more surgeries in the future. Over the past 6 months, God has been preparing us and Juan Pablo for this procedure. We chose Juan Pablo because of his burns and fell in love with his face. We will forever remember Juan Pablo as when we first met him. A change in his appearance, however, will not change his compassionate heart nor his infectious laugh and smile. We pray that as his appearance alters, his testimony of God’s grace will remain and motivate him in the work the Lord has prepared for him in the future. We ask that you lift up JP and us in prayer over the next several months as we respond by faith to the giant of surgery and its journey. Juan Pablo is the happiest child you will ever meet. And when he came to the United States with his new family, he was a glowing neon sign. He ran to the parade of people who were there to greet him: his mother’s grandparents,Buckner staff and friends Karen Perry and Margaret Johnson. And then he kept running, throwing his arms around Perry’s dog,smiling at strangers and hugging an unexpected bystander or two who happened to be there. His new mother’s hands were shaking.His father was all smiles. This day was the answer to everyone’s prayers: Juan Pablo was no longer an orphan. I couldn’t help but remember how, just a few months earlier, Juan P.’s new parents had bought him and the other boys at the Buckner Baby Home in Guatemala costumes of their favorite super heroes. The boys bounced around dressed as Buzz Lightyear, Superman and Batman and had an amazing time.But there were other heroes. John and Emily Wiggins didn’t sweep into Guatemala wearing capes and spandex.They came in with the gifts of themselves,with their willingness to love and open their lives and hearts to bring Juan Pablo back home as their son. Heroics may not be as out-of reach as you think.Maybe all it takes is love. The following article appeared on the front page of the Jay County Commercial Review newspaper on Saturday, January 9, 2010. This was a follow up article written after our story appeared in the paper during Thanksgiving 2009. Otherwise, the article has been pasted in its entirety below. A journey that brought a young boy from Guatemala to Jay County is "going great" after a month in Juan Pablo Wiggins’ new home. 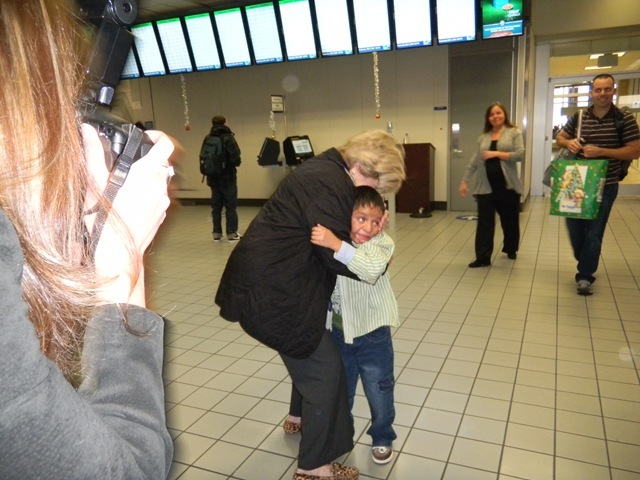 "He’s adjusting perfectly," Emily Wiggins said of her adoptive son Juan Pablo, who arrived in Indiana Dec. 9 to a greeting of 30 family, friends and church members at the Indianapolis International Airport. 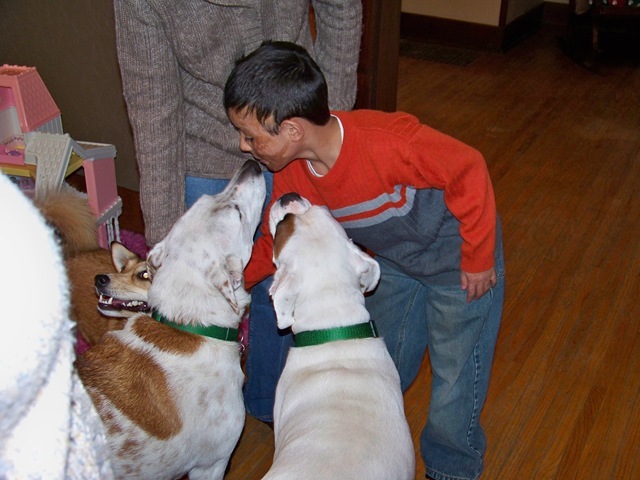 What started with a missions trip by Emily and husband John to the Central American country more than two years ago has brought a young boy to a new country with new sights, sounds and experiences like snow, children’s church and being licked by his grandma’s dogs. Not to mention learning a new language. The 7-year-old, who was severely burned in a propane explosion as an infant, calls his adoptive parents "papa" and "mama." "He’s so sweet. He just hugs everyone," says Emily. Emily, a former kindergarten teacher, began home-schooling Juan Pablo on Monday. She is teaching him his letters and working on English. Emily said he tells everyone his can speak English, but he really only knows about five words. "John’s really good," Emily said of her husband’s ability to speak Spanish. "We do okay." She said. Not wanting Juan Pablo to forget his native language, Emily and John attend a Bible study where some attending speak Spanish. Juan also has Hispanic friends that he plays with. Emily’s brother has twins the same age as Juan Pablo that he enjoys playing with and he also attends children’s church at The Rock. "He loves being around other kids," who says that Juan Pablo has made a snowman and snow angels with several friends who live nearby. Juan Pablo’s favorite place to visit is his grandma’s house with three dogs. He loves having them lick him, Emily said. He eats about anything, but his favorite food is spaghetti. Some of his favorite things to do are play on the computer and watch cartoons on television. The adjustment to his new home hasn’t been without issues. 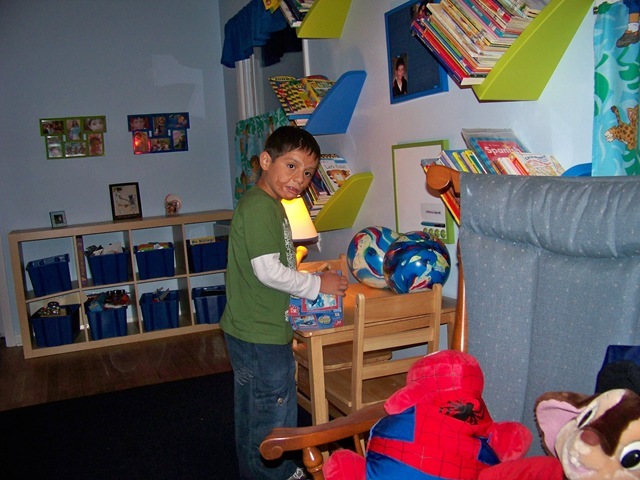 Juan Pablo’s bedroom was ready before his arrival, but "He didn’t want to be in there alone," said his mother. Juan Pablo prefers to sleep between John and Emily in their room. Even a Spider Man mattress beside their bed didn’t do the trick. Emily is expecting a baby in March and Juan Pablo says maybe he will sleep in his own bed when the baby comes. Days after his arrival in Indiana, a party was held at the Jay Community Center to welcome him home, with about 200 people attending. There were piñatas, super-heroes and inflatable toys and food made by some of Emily and John’s Hispanic friends. The couple, who had been trying to adopt Juan Pablo for more than two years, traveled there in November and stayed a month waiting for the adoption to be finalized. Determined to bring Juan Pablo home for Christmas, John and Emily spent plenty of time during November and early December, and Emily credits that time together as one of the reasons for him adjusting so well to his new life. 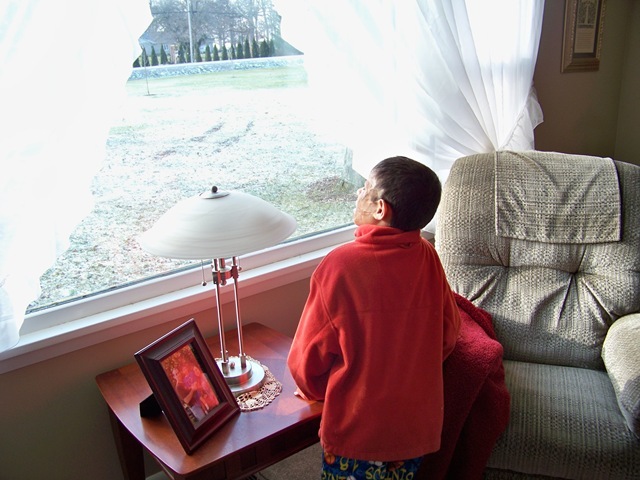 With the orphanage where he lived now closed, it is not an option for him to return. Christmas proved to be a special time for the new family, as on Christmas Eve, Emily, John and Juan Pablo read the Christmas story in the Bible and prayed for the other children who had lived with him for four years in the orphanage. Emily said Juan Pablo started to cry and said he wanted them to be safe. "We had a wonderful Christmas," says Emily. She says that Juan Pablo spent the entire day unwrapping presents because he wanted to stop and play with each one in between. Employees at Marion General Hospital, where John works, bought Juan Pablo a Wii and he had to stop and play the games he received. His favorites are a boxing and a racing game. Another favorite present was a suitcase full of super-hero costumes. Juan Pablo had to try each one on and John had to try his on also. 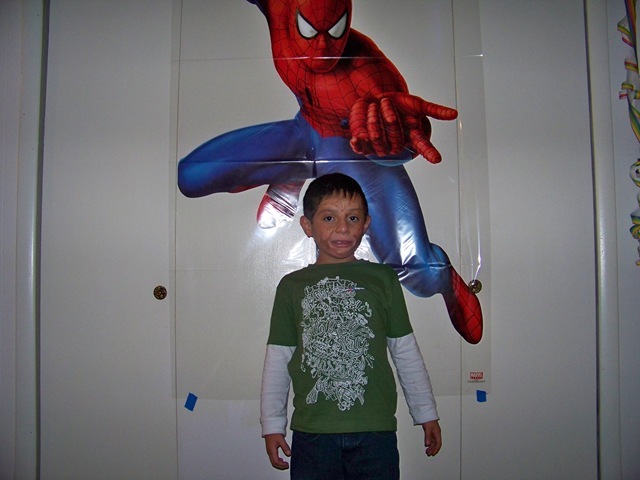 John had dressed up as Spider Man for Juan Pablo and the other children at the orphanage in Guatemala. Emily said the two then engaged in little battles. Life for us as a family in the US had started and before we knew it, Christmas had gone by and 2010 has arrived. Apologies to our friends who have been waiting for updates from us since our arrival. The past several weeks have been focused on spending and enjoying all of our time as a family that there has been little time to update the blog. The choice was easy We hope to make it up to you with an update that will rewind through some of the highlights of December ‘09. Since our arrival to the US, there would be many firsts to record, but none greater than the first day in JP’s new hometown of Portland, IN. 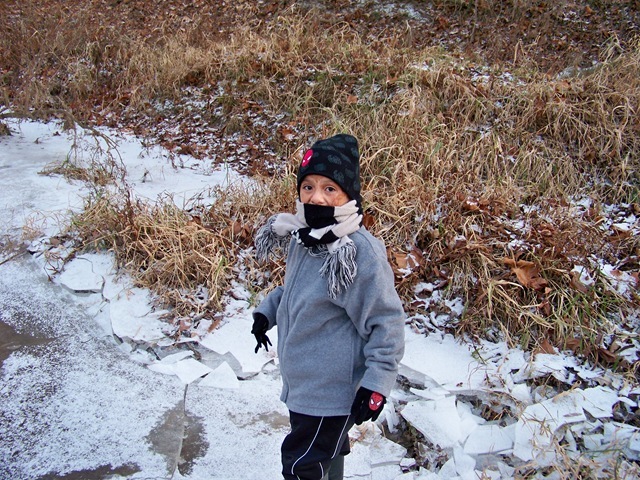 He awoke between his mom and dad on a clear, sunny morning with a dusting of snow on the ground. He was anxious to see more of his new house and discover new things that he hadn’t noticed the night before. 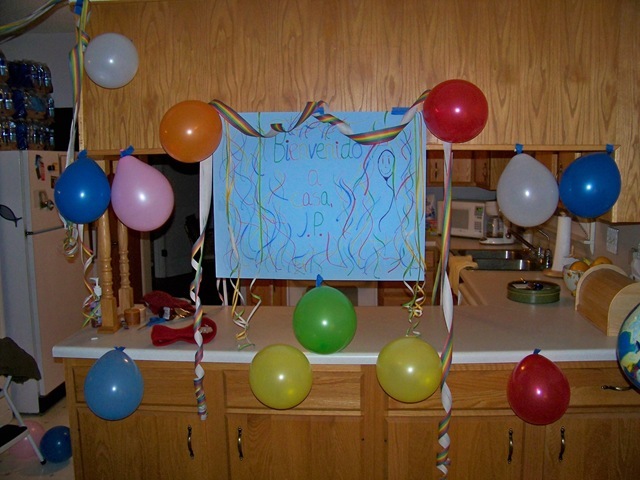 Welcome home decorations were still positioned throughout our house. The newness of JP home would never get old. 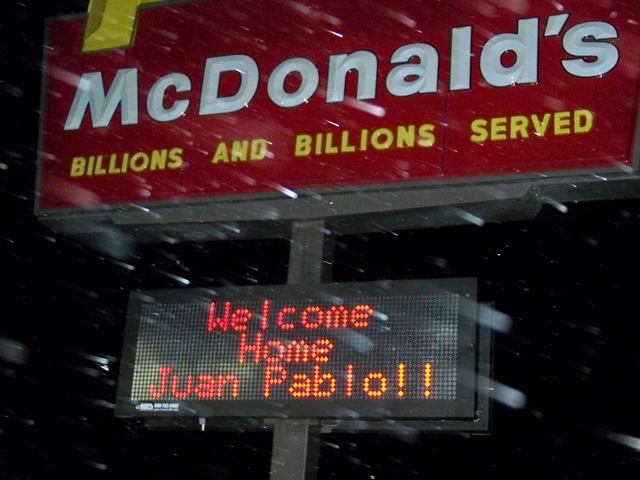 The day had finally come when we would bring Juan Pablo home. A long day of travel was ahead, but we received it with such excitement knowing that we would arrive in the US together as a family and begin the next segment of our lives. To top it all off, we anticipated groups of close friends and family meeting us at the airports to welcome us home. We loaded our 6 bags onto the Hotel shuttle and were off to the airport. We arrived to the Guatemala airport a few hours ahead of time to allow for any challenges we might face with crowds or immigration. There were no problems at all! For the first time, I didn’t mind filling out those dreaded customs forms since now I was able to complete one for Juan Pablo Wiggins. We caught a quick breakfast at McDonald’s, then waited at the gate. 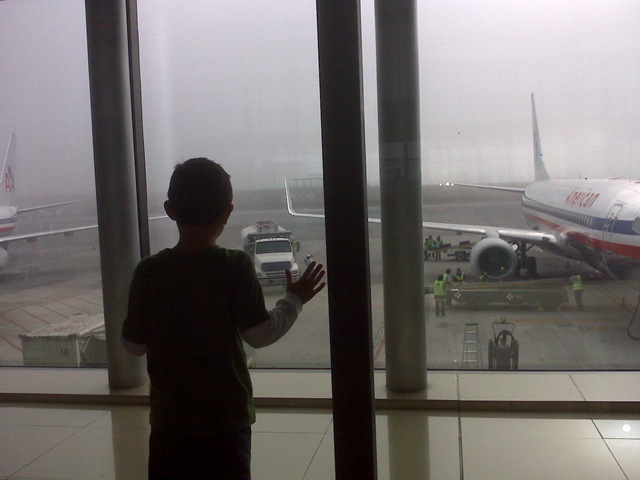 During our wait before boarding, we passed it by playing some video games and watching other planes take off. 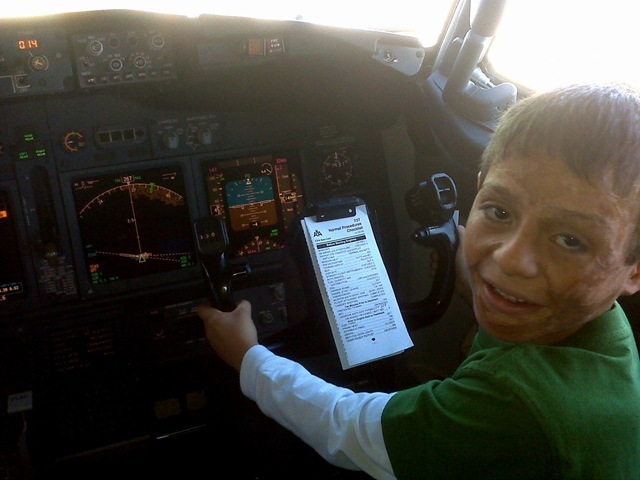 When coming aboard the plan, JP walked up to the cockpit and was greeted by the pilot, who gladly invited the young enthusiast in to show him the controls. JP was able to sit in the co-pilots seat and marveled at all the buttons and monitors. 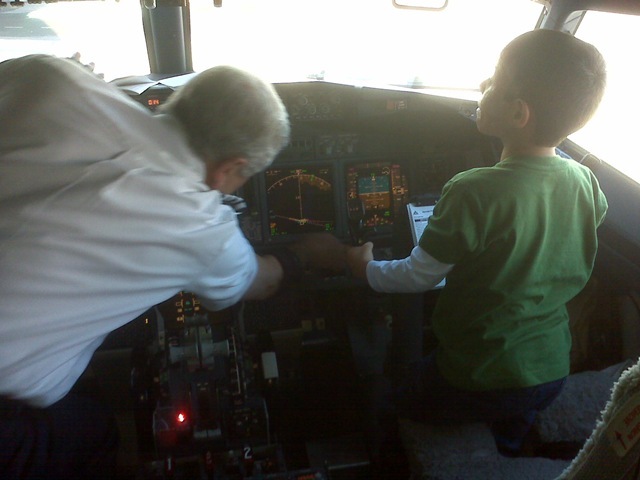 After his brief intro to flight simulation, he was given a pair of American Airlines wings, which we later pinned to our shirts. The pilot and crew on board our flight fell in love with JP and ended up hooking us up with some free snacks and some headsets to listen to in-flight audio later in the trip. 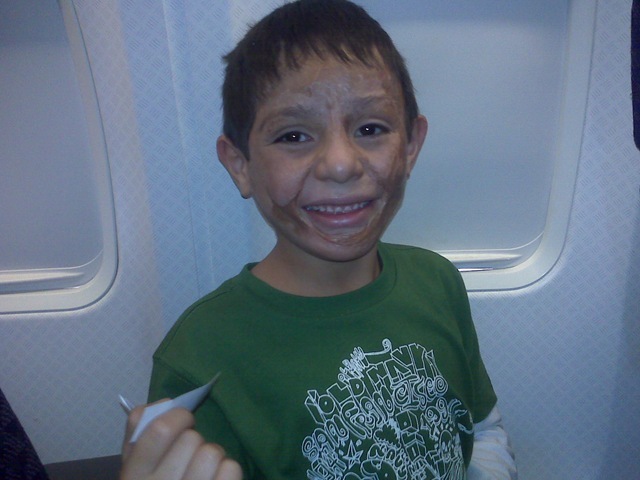 Juan Pablo wasn’t scared on the plane and was tickled as we sped up down the runway and made our initial ascent into Guatemalan air space. As we parted through the clouds and looked down at the land in which he was born, I told him to say “Adios Guatemala” (for now) and to admire the views of the beautiful mountains and land that is his home country. He didn’t sleep at all during our flight to Dallas. As we flew across the shore line from water to land in Texas, we explained that we had just crossed into the US. Juan Pablo yelled “Estados Unidos” and then gave us each a big hug. Tuesday was a special day for us as we would receive the final piece to the adoption puzzle and celebrate with wonderful friends in Guatemala. We ate lunch with Chiqui and Mabel at a restaurant near the Embassy. It’s hard to believe we spent a couple of hours there until it was time to enter the Embasy for our time slot to pick up the Visa. I guess time goes by when you’re having great conversation with good friends. Chiqui was one who opened her heart to first take JP into the Buckner baby home from Casa Aleleuia. They have a special history together as do we with her and family. We’re excited about the things God has placed in Chiqui’s heart, her passion for the Lord, and children of Guatemala. Next it was off to the Embassy for our 3:30 appointment to pick up the Visa. As a stack of envelopes sat on the other side of the window, names were called across the intercom system. We were a little nervous as we weren’t called in the first group, but thankfully our time came. We were first given JP’s passport with the Visa pasted inside. A sealed envelope followed that, which could only be opened by immigration in the US. We’re glad that we stayed around to review information on the front of the packet because we were called back for a 2nd packet that contained paperwork that they didn’t include in the first packet. Again, God had his hand on us to not allow us out those doors until everything was in hand. JP was officially a US citizen according to his Visa type. We had reached the end of the process! We were overwhelmed and embraced this moment with great anticipation and joy. To celebrate, we headed back to the Buckner office where the staff had prepared a time of prayer, worship, and thanksgiving. We formed a circle in the front office at Buckner Guatemala surrounded by many who have been with Juan Pablo from the beginning, then with us at the start of this adoption process. Amed led us in a short time of Bible application, then we sang a few worship songs in Spanish. This was a perfect end to JP’s story in his home land as we offered praises to God who made all of this possible. 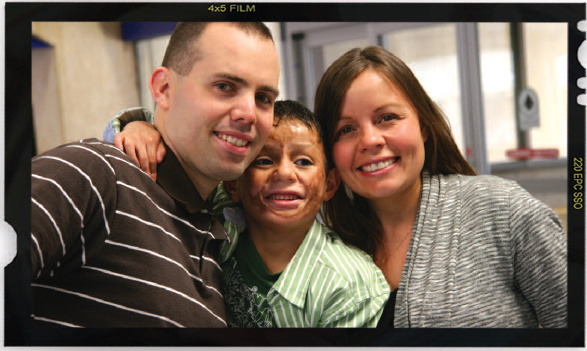 During time of reflection, friends Robert and Leslie Chace explained their remembrance of their first sight of Juan Pablo, which was at a girl’s home called Manchen. Later, he was moved to a home called Casa Alleluia, which contained babies and other toddlers of JP’s age at the time. We actually remember visiting that home on our first mission trip in 2005, but we later learned that Juan Pablo was on a field trip. We wonder how things may have changed if we had fallen in love with JP sooner, but trust that God revealed him to us at the perfect time where our hearts were prepared to surrender to His perfect plan in adoption. Roberto went on to say that he remembered JP’s face among on the other children and he was just as playful as the others. Furthermore, he mentioned his feeling after meeting us on our first mission trip in Guatemala, he knew God had big plans in store for us. Who would have known that it would have included this miracle boy who we now call our son. Tears continued as more shared stories, then Emily and I spoke to thank all of those at Buckner for opening their hearts to JP. We wanted them to know that Guatemala is his first home and we will continue to pour all of our love into him in his new home in the US. All agree that God will use Juan Pablo in a unique way when he is older. Perhaps it would even be to return to Guatemala to minister to orphans and bring encouragement to many. We will dearly miss all of our friends in Guatemala, but look forward to remaining in close contact with them and in God’s time, returning for future visits and continuing in more work that Lord has prepared for us there. We wrapped up our ceremony with some tamales and Ponche, which is an excellent beverage blend of a variety of fruits. We loved it so much that we went to Paiz afterwards to pick up a few manufactured packs just to get the recipe. What a way to end our journey in Guatemala, but to offer our thanks to our God who again has proved He is able to do above all we can ask or image. Tomorrow is our much antipated return home. We’re looking forward to the reunions in Dallas and Indianapolis!! !